Home › National bird of India › Himalayan snowcock › Black francolin - Francolinus francolinus. The black francolin (Francolinus francolinus) belongs to the pheasant family, Phasianidae. The francolin is a game bird and is distributed in India, Pakistan, Afghanistan, Sikkim, Bangladesh, Cyprus, Turkey, Iraq and Iran. There are six recognized subspecies of these birds, namely, F. f. francolinus, F. f. arabistanicus, F. f. bogdanovi, F. f. henrici, F. f. asiae and F. f. melanonotus. In India the subspecies, F. f. henrici, F. f. melanonotus and F. f. asiae occur. It is the state bird of Haryana state, India. They have been introduced into USA, Hawaiian Islands, Caucasus and Guam. The International Union for Conservation of Nature (IUCN) has categorized and evaluated these francolin species and has considered them of "least concern". These francolins are medium sized birds measuring 30 to 35 cm in length and weighing 400 to 500 grams. 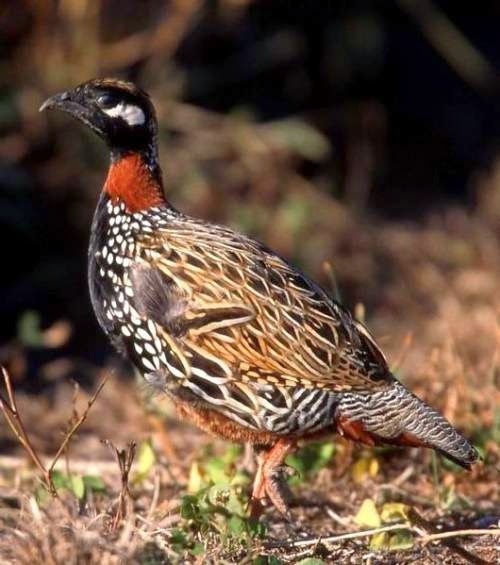 The male francolins are larger than the females. The males are black with a white cheek patch and brown neck. The black flanks have white spots and the back has golden brown stripes. The narrow tail has black and white bars. The legs are reddish brown. These francolin birds inhabit scrubs and tall grass near water bodies. These francolins feed on insects, larvae, grass, seeds, cereals, grains, shoots, berries and leaves. The male is monogamous and guards the incubating female. A clutch of 10 to 15 eggs are seen in the nest. Current topic in Birds of India: Black francolin - Francolinus francolinus.